The city is moving ahead with the sale of former plywood lots A and B to the owners of Canadian Alberni Engineering for $250,000. May. 25, 2016 5:00 p.m.
Canal Beach steward Sandra Gentleman gets ready to kiteboard at Canal Beach. Former plywood lots A and B can be seen behind her. “The city is proceeding with the sale of lots A and B of the former plywood mill site to 1076565D B.C. Ltd. This numbered company is wholly owned by Canadian Maritime Engineering which in turn owns Canadian Alberni Engineering,” Mayor Mike Ruttan announced at city council on Monday night. The price is based upon the appraised price of the property in its current state. “Canadian Alberni Engineering intends to grow and expand their current marine industrial business in our community and we look forward to a successful development of its property,” said Ruttan. The sale, which is not yet final, comes with conditions: CME assumes responsibility for the contamination of the land and absolves the city of liabilities associated with such; and CME must commence industrial use activities within 36 months of the sale including the construction of site improvements valued at a minimum of $500,000. If the development covenant is not met then the city can buy back the land for the original purchase price.The announcement came as a report from in-camera at the tail end of Monday’s meeting, something that sits poorly with residents advocating for increased recreational waterfront access. That includes former Port Alberni mayor John Douglas, who was pivotal in the creation of Canal Beach (former plywood lot C)and has advocated for increased public waterfront access. “It’s difficult to comment on an issue over which there has been absolutely no transparency and zero public consultation,” said Douglas. Douglas added that he didn’t think that the lack of transparency he sees in the decision gave either the public a fair chance to embrace the new ownership or the company the opportunity to start out on a good foot. Canal Beach steward Sandra Gentleman said she was disappointed by the sale of waterfront property to industry. “This council and mayor have just sold off one of the last remaining waterfront properties without any public consultation,” said Gentleman. However, Ruttan said that with the restrictive covenant on the plywood lots, this was the best way to deal with them. “There are some significant remediation issues there and we believe it has the potential to create significant additional economic activity and significant additional jobs for residents in this community, both people who currently live here as well as people who may be attracted to the new jobs that could come with that,” Ruttan said. The city has tried to dispose of plywood lots A and B before. 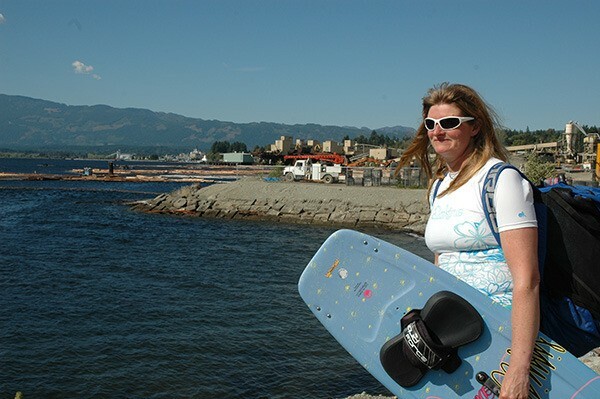 In July 2014, it leased the two former plywood lots to the Port Alberni Port Authority who attempted to sublease it to Canadian Alberni Engineering. The sublease was unsuccessful and as PAPA didn’t meet the city’s requirements for development on the site, the city took back possession of the two lots at the end of October 2015.